From the illustrator of the #1 smash The Day the Crayons Quit comes another bestseller--a giggle-inducing tale of everything tossed, thrown, and hurled in order to free a kite! When Floyd's kite gets stuck in a tree, he's determined to get it out. But how? Well, by knocking it down with his shoe, of course. But strangely enough, it too gets stuck. And the only logical course of action . . . is to throw his other shoe. Only now it's stuck! Surely there must be something he can use to get his kite unstuck. An orangutan? A boat? His front door? Yes, yes, and yes. And that's only the beginning. 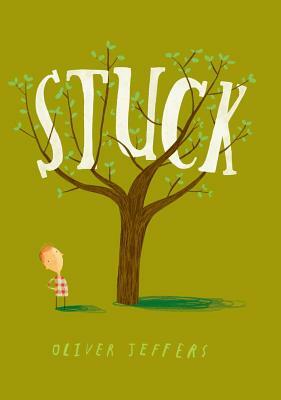 Stuck is Oliver Jeffers' most absurdly funny story since The Incredible Book-Eating Boy. Childlike in concept and vibrantly illustrated as only Oliver Jeffers could, here is a picture book worth rescuing from any tree. Oliver Jeffers (www.oliverjeffersworld.com) makes art and tells stories. His books include How to Catch a Star; Lost and Found, which was the recipient of the prestigious Nestle Children’s Book Prize Gold Award in the U.K. and was later adapted into an award-winning animated film; The Way Back Home; The Incredible Book Eating Boy; The Great Paper Caper; The Heart and the Bottle, which was made into a highly acclaimed iPad application narrated by Helena Bonham Carter; Up and Down, the New York Times bestselling Stuck; The Hueys in the New Sweater, a New York Times Best Illustrated Book of the Year; and This Moose Belongs to Me, a New York Times bestseller. Originally from Belfast, Northern Ireland, Oliver now lives and works in Brooklyn, New York.